Zimon Drake grew up on the streets of London. He was a prominent 70s Punk and has lived a troubadour’s life as a fixture of Soho where he owned and ran the mythical Black Gardenia club for many years. Zimon is an experienced screenwriter and song-writer. “To Die With Horses Wouldn’t Be So Bad” for New River Press is his first collection of poetry and collects words and images from his lost London years. Rosalind Jana worked her way through English at Oxford by writing for The Guardian, Radio 4 and British Vogue. She comes from a family of poets- her parents published poetry books for teens in the 1990s, which they wrote collaboratively (a practice which New River Press is very interested in). Rosalind is 20. Her first collection ‘Branch and Vein’ has a poise and silvery assurance that belies her youth. Niall McDevitt is one of our most important British-Irish Poetry historians. His ‘Poetopography’ walks (wandering lectures) bring alive the psychogeography of London and the lives of the great Modernist poets. He is an influential figure in the living history of British Poetry recently instigating among other things the David Gascoyne Celebration at The Poetry Library. As a poet Niall has an ominous assurance and Yeatsian grandeur, and a depth of vocabulary that is unrivalled in contemporary poetry. Heathcote Williams is the author of ‘Whale Nation’, ‘Sacred Elephant’, ‘Falling for a Dolphin’, ‘Autogeddon’, and ‘Royal Babylon’. He invented a particular kind of long-form lyric and polemic poetry, which was an important early catalyst for the ecological movement. Philip Hoare called ‘Whale Nation’, “the most powerful argument for the newly instigated worldwide ban on whaling.” Ted Hughes said, “his poems are overwhelming, brilliant, cunning, dramatic and wonderfully moving – a steady accumulation of grandeur and dreadfulness”. Heathcote has been a powerful counter culture figure in Britain for five decades, instrumental in the underground journal The International Times and the creation of the squatters free state Frestonia in Notting Hill. He has mastered his own distinct brand of long-form lyrical-moral poetry, which is at once uplifting and educating, and he remains an inspirational and sentinel figure for younger generations of British anti-authoritarians. 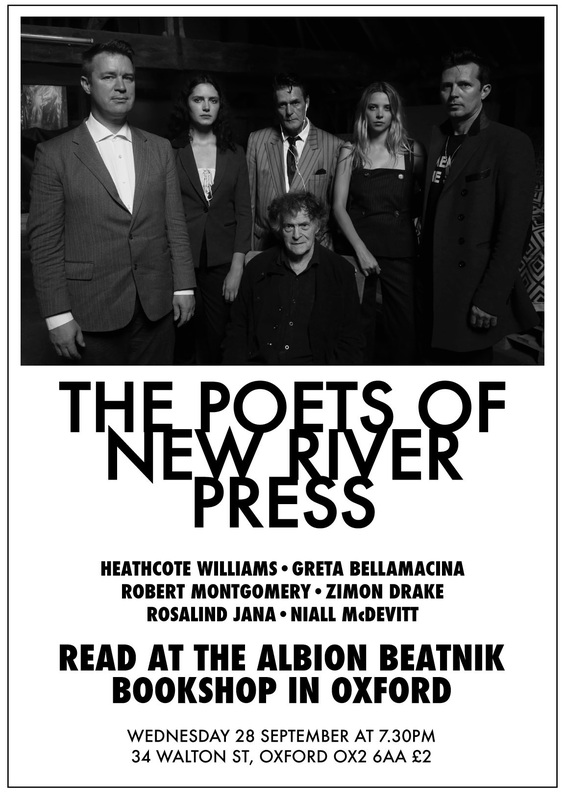 This entry was posted on 27 September, 2016 in homepage and tagged Albion Bookshop, Greta Bellamacina, Heathcote Williams, New River Press, Niall McDevitt, Oxford, poetry readings, robert montgomery, Rosalind Jana, Zimon Drake. Bookmark the permalink.